A unique collection of 304 small molecule modulators with biological activity used for epigenetics research and associated assays. • Nat Med . 2017 Nov;23(11):1352-1361. • Cell . 2018 Sep 20;175(1):186-199.e19. • Cell . 2017 Jan 12;168(1-2):264-279.e15. • Cancer Discov . 2018 May;8(5):632-647. • Cancer Discov . 2018 Mar;8(3):354-369. • Cancer Discov . 2017 Sep;7(9):984-998. 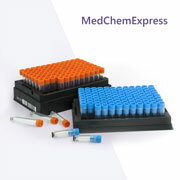 • A unique collection of 304 small molecule modulators with biological activity used for epigenetics research and associated assays. • The library contains epigenetics-related compounds targeting HDAC, Histone Demethylase, Histone Acetyltransferase (HAT), DNA Methyltransferase (DNMT), Epigenetic Reader Domain, MicroRNA, etc. • A valuable tool for chemical genomics, epigenetic target identification in pharmacogenomics, and other biological applications. • Rich documentation with structure, IC50, and other chemical & biological data.